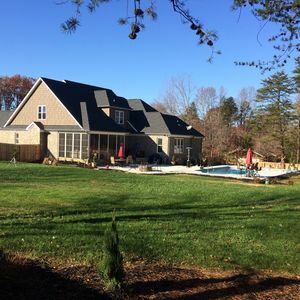 ‘Castle in the Country’: 15-20 mins from Greensboro, High Point & Winston Salem. We welcome you to our home which features a rustic yet elegant flare. Here, you can have the vacation feel without falling out of routine. Stay current with your work in our home office, while maintaining your active routine in our home gym. Afterwards, unwind with a game of pool in our billiards room - or - enjoy cocktails and conversation in our open kitchen or outside on the back patio. No matter the reason for your stay, we are confident we have the space and amenities to accommodate! Conveniently located 10 mins from GSO airport and only 15-20 minutes from Greensboro, High Point and Winston-Salem. You'll also find grocery stores and restaurants conveniently located just minutes away from the neighborhood. 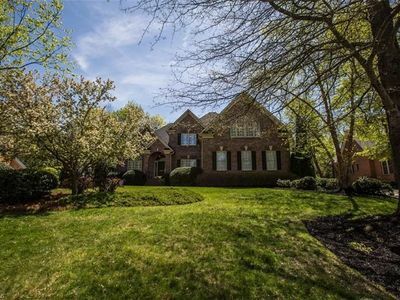 This home has two large bedrooms and one and a half baths. The first bedroom has a queen bed with an optional additional queen air mattress and the second bedroom has a king bed. I also have 2 additional queen air mattresses that can accommodate 4 more people. Kernersville is right between Winston-Salem, Greensboro, and High-Point. It is a perfect place to stay if working in Triad, attending a wedding, or just visiting family. There is also a jetted tub in one of the spare baths. Breakfast, laundry service, and printing service is available. I provide all the essentials. There are two big back decks along with a grill and a fire pit for your after work relaxing needs. I'm available by text 24/7. This house has 6 beds. Two rooms are available upstairs that have one king sized bed, one queen sized bed, and one queen air mattress. Upstairs there is also a full bath with a jetted tub. The main floor holds the kitchen, dining room, living room, and laundry room. Downstairs there is an apartment that has one king sized bed, one full sized bed, and one queen air mattress with a living room flat-screen tv and full bath. 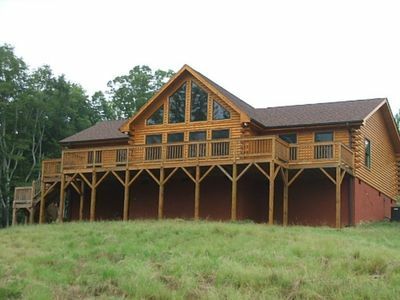 This house is perfect for family meeting points for out of town relatives, business trips, or just to vacation in. There are two big decks for grilling and relaxing. There is also a fire pit. If you like to exercise the neighborhood is great for going on jogs or taking a dog for a walk. The neighborhood is also very safe. A police officer lives across the street and a school teacher is next door. A private jetted tub awaits your relaxing. Peaceful serene get a way from busy Greensboro High Point and Winston Salem. The add sometimes states that is three bedroom. It is NOT! It has two bedrooms and one queen air mattress. I can't wait to meet you upon check in to give you a tour of this beautiful remodeled property! Quiet hours are from 10pm to 6am. Please keep all noise to a minimum during these hours to avoid disturbing neighbors. This charming 1260 square foot home is a wonderful retreat for travelers - family occasions, traveling nurses, business, sporting events. Home is near Winston Salem, Greensboro, High Point, Walker Town - High Point Furniture Market, High Point University Graduation, Wake Forest Graduation. If you are traveling with a dog we have a 1/2 acre fenced in yard with easy access through the back door. There are old pine floors and ceramic tile throughout. The original heat source in the home was 3 fireplaces and a wood stove. We now have new central heat and air. There are new windows on every side of the house providing a bright cheer place to be. 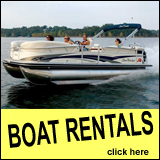 We have 5 furnished rental properties in the area - Kernersville, High Point and Greensboro. We have 5 star feedbacks on all of our properties. The kitchen is filled with all you need to prepare you meals. Everything from pots, pans, coffee maker, blender, microwave, electric stove/oven and refrigerator to spices, silverware, cupcake pans, baking dishes, popcorn, popcorn popper and more are included. Bedrooms have.... Beds are CLEAN - new memory foam mattresses with mattress covers. Sheets are new white. Pillows all have pillow covers. There is a queen bed in each of the 2 front bedrooms. There is a futon bed in the back bedroom. There is a pull out sleeper sofa in the living room with a new memory foam mattress. Kitchen has... Microwave, Electric oven/range stove, Dishwasher, Empty Fridge, Toaster, Regular coffee maker, unbleached coffee filters, silverware, utensils, wine opener, cookie sheet, cupcake pans, serving bowls, baking dishes, food storage dishes, popcorn popper, crock pot, blender, grater, coffee, honey, sugar, creamer, measuring cups, measuring spoons, dishcloths, aluminum foil, ziplock bags, plastic wrap, non stick pan, stainless steel pans, dishwasher soap, dish soap, scrub pads, trash bags, paper towels, salt, pepper, spices, cinnamon, etc... Dining Room has... Seating for 8, beautiful view through picture window, Keurig, keurig coffee cups, tea, electric hot water pot, travel brochures, guest closet. Guest Closet has... Extra bath towels, hand towels and washcloths, puzzles, books, games, cleaning supplies, cleaning rags, mop, broom, dustpan, pail, pens, paper, little things you may forget like - toothbrush, toothpaste, shampoo, soap, reading glasses, nail file etc.. Bathrooms have.... Bathrooms include travel soap and shampoo, towels, hand towels, washcloths, toilet tissue, kleenex and more. Laundry Room has... New washer and dryer, laundry detergent, first aide kit, flashlights, extra light bulbs, recycling can, laundry sink. House includes 2 TV, cable TV with 200+ channels and FREE wifi. One TV is in the living room and the other TV is in one of the front bedrooms. For longer stays we can add a 3rd TV in one of the other bedrooms. We have 5 furnished rental properties in the area - Kernersville, High Point and Greensboro. 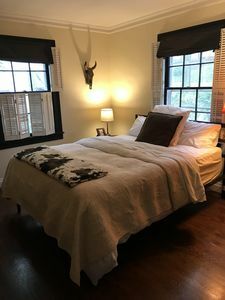 Here is some of our guests feedback.... Oct 6, 2016 - Sarah S. said... Charming southern farmhouse Date of Stay - Jun 3, 2016 5 STARS OUT OF 5 REVIEW My friend and I stayed here for 3 months for our job and we loved it. 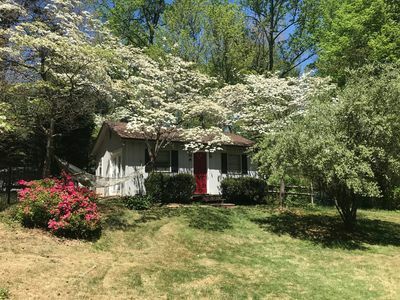 It is a perfect little, quaint house in a small NC town that is a close drive to bigger cities such as Winston-Salem and Greensboro. The house sits on a quiet lot with plenty of yard which was great for my dog (even has a fenced in portion!). We always felt safe in the house and enjoyed sitting out on the porch on the wooden swing! 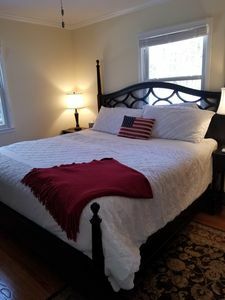 We highly recommend this for anyone needing a place to stay for a long stay or short weekend and is fully equipped with everything you need from towels to a cookie pan. Recommended for: Pet-friendly, Girls Getaway, Age 55+, Families with Teenagers. My Response Hi Sarah, It was wonderful having you and Meagan stay in our little farm house for 3 months. I am glad you found the house a quiet and relaxing place to be. I hope your traveling professions bring you back to the Kernersville/Winston Salem/Greensboro area again. This house is perfect for traveling nurses, occupational therapists, or anyone living away from home - especially if they have dogs or cats. We are currently booked into Jan of 2017. An elderly couple is staying there while their house is repaired after a fire. This bright - cheery home is a much better place to be than a hotel. I wish you the best of luck in your travels. Stay in touch. 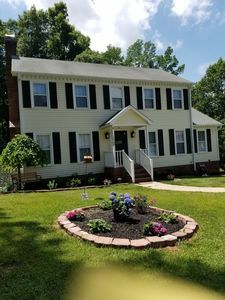 Hugs, Maggie Oct 28, 2016 Krystine E. said... Charming Cottage Kernersville, NC Date of Stay Oct 21, 2016 5 STARS OUT OF 5 REVIEW This home was immaculate, charming and a great location for the purpose of our stay. It is near a well maintained cemetery. The street and the area are both darling and welcoming. We plan on booking again. The owner is wonderful, left us little gift's, plenty of towels, soaps, etc. It has a washer and dryer, wifi and tv's. It was the home away from home. We really enjoyed it. My Response Thank you for such a lovely review. I'm glad you enjoyed our amenities like TV's, towels, soaps, washer, dryer etc. There is something about this house that is so unique. The couple staying there now for 3-5 months love how quite and peaceful it is. They love the location and how we take care of them while there house is repaired from a fire. It was a pleasure working with you. You are welcome back any time. Take Care, Maggie We have 6 furnished rental properties in the area - 2 in Kernersville, 1 in High Point and 3 in Greensboro. Imagine a fairy tale cottage in the woods next to a creek - a nature lover's paradise on 10 acres in a park like setting. At Laughing Brook Cottage, you will listen to the birds sing each morning and let the frogs lull you to sleep each night. Deer, rabbits, and other woodland creatures may been seen from your porch. All this and still close to everything! Owner lives in main house across driveway so there is someone there to make sure your needs are met. PLEASE READ all the info below before contacting me to make sure it is really suitable for you. No children please! Click on More Details! LOCATION: Near County Line Rd & Beeson Rd (Kernersville). Actual address given after booking. NOTE: Google tends to add at least 5 minutes to any location we have discovered. Things are closer than you think! 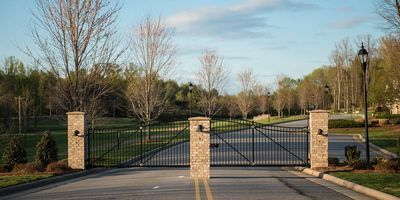 It's about 20 minutes to the furniture district, Greensboro Coliseum, several golf courses and events, the famous Piedmont Triad Farmers Market, Historic Winston Salem district, and more. The amazing Hanging Rock State Park is only 28 miles away! Pilot Mountain is 39 miles and the Blue Ridge Parkway is close enough for a day trip. VERY IMPORTANT! Please, no children (including infants). Our pool is not fenced and there are student dogs & my dogs on the property so I cannot risk the liability. We will consider ONE older teen. ENTIRE PROPERTY IS NON SMOKING. Also no parties or gatherings. Maximum number of guests is 4. NO long term rentals (maximum stay is 2 weeks - minimum 2 nights). AMENITIES: 2 bed/ 2 bath. 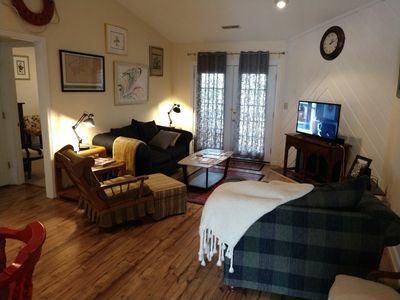 All the creature comforts are in this charming cottage, including good Wifi and streaming TV. The 2nd bedroom is up a spiral staircase. It has an attached bath and has it's own private balcony with a gorgeous view of nature. Across the creek from the cottage is our very own nature preserve area with ponds and streams. And for those quiet times, I even provide adult coloring supplies and encourage guests to add their artwork to the collection! As mentioned, I reside in the main house which is across the driveway. In the lower meadow, I teach dog agility classes. These classes are of short duration and should not effect your stay in the cottage. Email messages are responded to quickly and are much preferred over phone calls. Come stay in our beautiful factory loft. 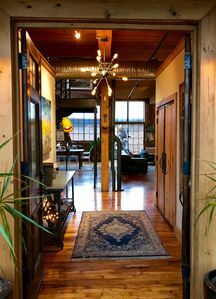 Turn of the century factory loft with old maple floors, big beams and high ceilings gives you a very urban feel. The open floor plan is perfect for entertaining. The master bedroom suite has a very relaxing bathtub and a shower with multiple heads. The second bedroom has its own full bath. There is fabulous restaurants within walking distance and a nice neighbor cocktail lounge right across the street. You will love the downtown of Kernersville! Home includes: Whole House wifi internet and cable TV. 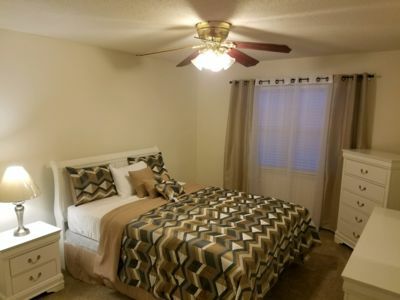 2 Bedrooms - New Queen Beds, Smart TV, empty dresser & closet, night stands with lamps. 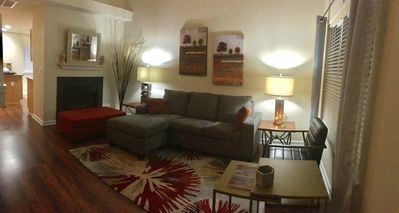 Living Room - Smart TV, Chairs, end tables, area rug, door for privacy. Laundry Closet - Washer Dryer - Shelves. Bathroom - Porcelain Tub, Towels. Kitchen - Fully Stocked with New Fridge, Stove, Microwave, Toaster Oven, Crock Pot, Pans, Dishes, Silverware, Utensils, Storage Containers, Wine Glasses. Month to Month rate is $2250 3 Month rate is $1900 per month 6 Month rate is $1800 per month Minimum 30 day stay. Beautifully decorated home in one of a Summerfield's most desirable neighborhoods. Great home for entertaining or enjoying a movie in the theater room or having a relaxing evening on the patio sitting by the fireplace. Only 5 minutes from grocery, gas and dry cleaners. Less than 10 minutes from PTI Airport and only 20 minutes from downtown Greensboro or High Point, the furniture capital of the world and home to the International Home Furnishings Center. Brand new 4 bedroom-3 bath home. 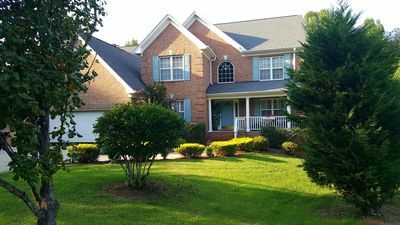 The house is near GSO airport and restaurants. The rental is Bed and Breakfast style and I would like to have 3 guests for $300. per night total. 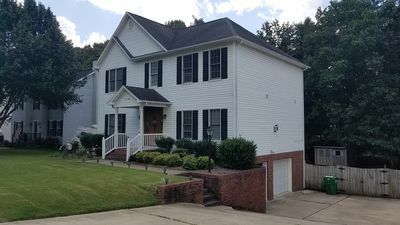 The house is very close to GSO airport, on Uber route, and conveniently located near to all restaurants in both the High Point and Greensboro NC area. The owner of the house will be on site throughout the stay. No smokers please. 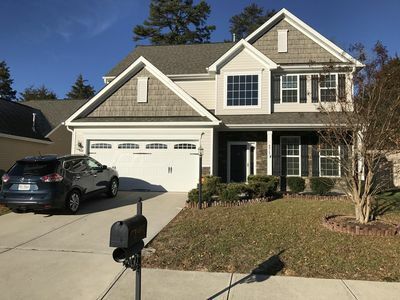 This distinct home is located in northwest Greensboro (Summerfield) and minutes away from popular sites in the Triad area. Our home is within 1-3 miles to Summerfield Farms and the Gardens at Gray Gables wedding venues. Set in a scenic country neighborhood our home is minutes away from fine and family dining, shopping at Friendly Center, and organic and regular grocery stores. We are very accessible to all major interstates and roadways and 10 minutes to the Piedmont Triad International Airport. A short 20 minute drive puts you in downtown Greensboro, the Coliseum or the High Point Furniture Market. Its charming country setting offers peaceful relaxation and convenience to the city. A gas fireplace with ample sectional seating offers a relaxing night to a busy day. The large wooded backyard with screened porch and brick patio with a stone fireplace offers privacy for warm summer evenings. The perfect home for a small family gathering. GOLF COURSE Views with everything you need for High Point Furniture Market! 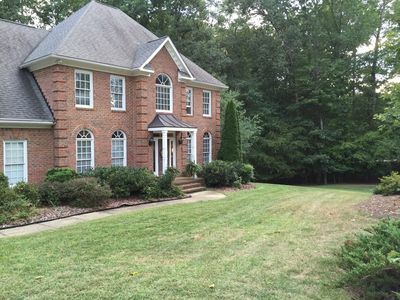 This home sits on Greensboro's Sedgfield Golf Course, with GORGEOUS VIEWS of the 6th Green!!! Traditional home, with over 3,000 square feet of living space! Entire home was remodeled in 2017. Dinning room, as well as Kitchen has seating for six. There are 5 Bedrooms, with 1 King and 3 Queens. Office is spacious, with free wi-fi. Spectacular home for entertaining! Located 15 minutes from the HIGH POINT FURNITURE MARKET! 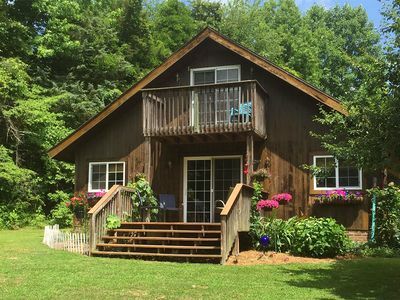 Wonderful cozy countryside getaway located on 22 enchanting acres. Come relax in our luxurious Hot Springs hot tub, take a walk in the field or forest. Your home away from home awaits with 3 bedrooms and 2 baths, fresh linens, and accommodations for up to 8 guests. Our cozy getaway will surely not disappoint. 2 Large screen TVs give everyone a place to enjoy their favorite shows and movies. We have a beautiful dining table to sit 6 guests plus 2 more stools at eat-in kitchen counter. 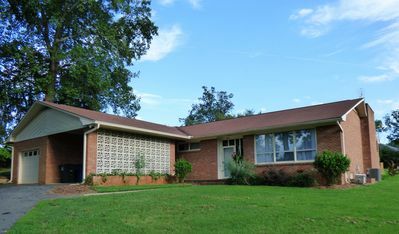 Mid century modern home with all new interior on a quiet street just a mile off Bus. 40 and Salem Lake. Master BR has queen bed and bath(w shower); second bedroom with a queen bed and third bedroom with double bed. 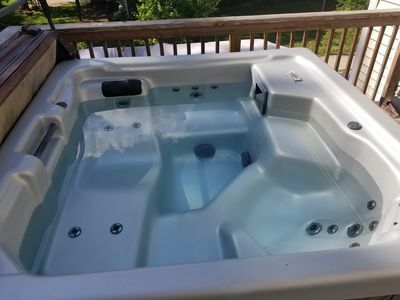 Stackable washer and dryer inside, and a beautiful open deck in the back. 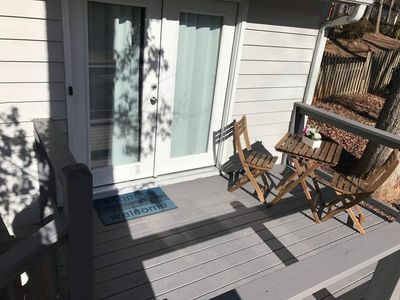 Leave the hustle and bustle of Winston Salem and enjoy the peace of sitting on the back deck with just the nature for your company. Located on a short, quiet street that is a bike ride away from entering Salem Lake nature trail. Wake Forest Univ., BB&T ballfield or the two of our finest hospitals are just ten minutes away. Greensboro is only twenty minutes to the east. 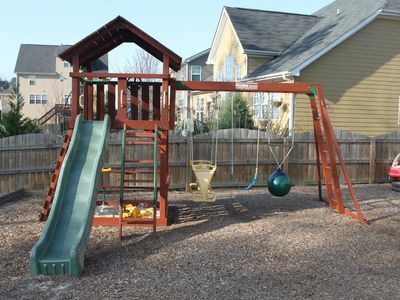 A great Townhome located near all Greensboro has to offer. Close and convenient to shopping, parks, universities, airport, highways, restaurants, and many businesses. Two bedrooms with queen beds and two full bathrooms will accommodate you during your visit. A full kitchen allows you the ability to prepare your own meals and relax in a home environment. A community pool is available seasonally for your enjoyment. Perfect for corporate travelers, health care professionals, those who are relocating to the area, or a quick trip to the triad area. We look forward to hosting you on your next trip to Greensboro! Originally built in 2010 this 2100 square foot two story home is ideal for the furniture market. Your group can network all under one roof. Sleeps 6 comfortably. Second floor has the master bedroom with a king bed and guest bedroom with 2 twin beds. Two full bathrooms upstairs. On the first floor there is a guest room with a queen bed and full bath. Hi-speed wifi will keep you connected. A renovated kitchen is open to the family room. No pets and no smoking. 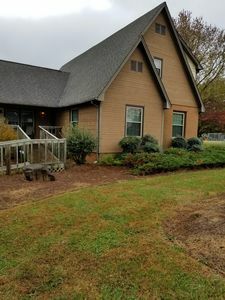 3 Bedroom 2 bath home in NW Greensboro. The home is close to great local restaurants, bars and shopping. At less than 4 miles to the airport it is the perfect place to stay in Greensboro. Two of the bedrooms have a Queen bed and one bedroom has a queen air mattress. There are free weights, pull up bar, resistance band and loops available for the fit enthusiast. Also Golds gym and Planet fitness are right down the road. Description: House is located in the very high end cozy Neighborhood, High speed gigabit wireless internet, Cable TV, Fully automated with CPI security, large projection HD Theater. Main level has one bedroom with attached full bath, Office room, living room with full sofa, large flat screen 65"TV, Dining room, large kitchen. Great patio with seating, Swing and Gas grill. Upper level has beautiful master bedroom with king bed, 55"TV, other four bedrooms with queen beds. HOUSE RULES ?? * If more then 6 guests I will give you the entire house. 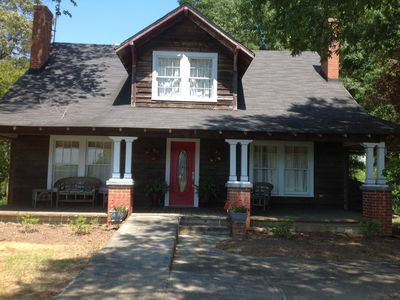 *Beautiful House 10 Minutes From I-40,85 , Airport and High Point Furniture market. *The home booking guest must be age 22 or older. * Please let me know the purpose of your visit. For example like business, family, or others. * CPI SECURITY:— CPI installed 3 cameras. One in front yard, one in backyard and one inside which is pointed toward back entrance and garage entrance. No recording happened at anytime unless alarm is on and somebody break in the house. For guests satisfaction I always covered the inside camera and let them know when guests check in. *Ring bell:— There is front door outside camera which triggered when somebody ring the doorbell. * Smoking is not allowed inside the house but allowed out side the house or on patio * When you (guests) Check out my home please make sure you not leave any of your belongings in the home. * The homeowner and the home insurance is not responsible for anything you forget in the house. * Homeowner or the Insurance is not responsible for anything the guests lost, stolen or damaged of there personal belongings * If I (host) notice any activities which is against my home rules I (host) reserved the right to check my house anytime by giving short message notice through HomeAway portal. Guest(s) must allow host to come in the house. * The numbers of guest who are staying must be same in the numbers the guest booked. This rule will be strictly enforced. * Strictly parties and events are not allowed. * I do not allow my kitchen for heavy cooking. * Any type of Drinks and food is not allowed in any room of the house except water. * Please no illegal or immoral activities. * No loud music allowed. * Before you leave home each time please make sure all doors and windows are locked and gas stoves are off. * Stickily Visitor(s) is/are not allowed in my house at anytime during guest(s) stay. * Please watch your children(s) all the time and never-ever leave you children alone at my home property. * Please Do not try to mess with any wiring of any home theaters. * Any kind of pet(s) is/are not allowed in my property * Parking:— Guest(s) can park 4 vehicles on the driveway. Garage parking can be allowed with permission. * Please do not block the mail box with your vehicle because mail carrier will not deliverer mail. * Home Access:- Guest shall allow homeowner the full access to the property for purposes of repair to fix the problem If something gets damaged please give me a call immediately. Homeowner will not be responsible, If internet, cable or any utilities is out due to any fault(s) by Mother Nature, company or by City repair or any mean(s) which is not in homeowner’s control. * Insurance:- The homeowner or the homeowner’s home insurance are not responsible for any injuries, accidents, illness or death of the guest(s) or visitor(s) on the homeowner’s property where the guest are staying. The homeowner or homeowner’s home insurance are not responsible for loss of personal belongings or valuables of the any guest(s) or visitor(s). *All guest(s) and visitor(s) must follow the High Point City Noise Ordnance which is:- This ordinance prohibits anyone from making unreasonably loud, disturbing noises caused by radios, sound producing or amplifying devices that annoy or disturb,particularly between the hours of 11:00pm and 7:00am. * Please be aware that by renting this property you fully agree to these terms/rules. *All types of money dispute must be resolved trough HomeAway resolution center team. Host is not responsible any kind of refund I will appreciate for your cooperation. I reserved the right to cancel booking at anytime if I find out that the guest(s) not following the house rules. 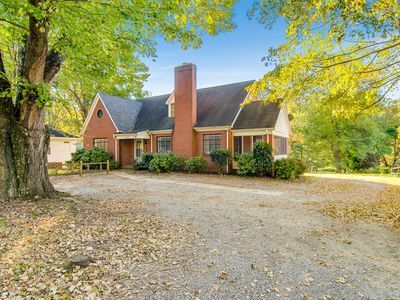 A complete 3 bedroom house in a rural setting but only 20 minutes or less to Greensboro, High Point & Winston Salem, NC. Peaceful & private surroundings with fully refurnished kitchen, it accommodates 6 comfortably with 3 Queen bedrooms. Built in 1916 with now modern-conveniences. It is furnished with antiques & modern bathrooms that are handicapped accessible. Self checkin is allowed. I will be available to help in any way or I can stay out of the way completely. Beautiful 2800 sq foot home away from home! Convenient access to Palladium shopping mall, Downtown High point, Golf, Sedgefield CC, restaurants, highway 40, 73 and 311. 3 nearby grocery stores and state of the art movie theater. Can reasonably sleep 7 up to 9 adults comfortably using a supplied air mattress on lowest level. If there isn't any sharing of bed space than 6 is your maximum. 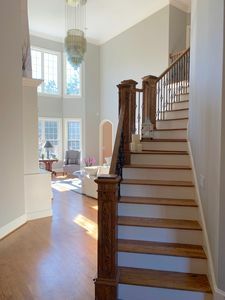 Entire home is freshly painted; 1st and 3rd level of home is newly carpeted while the main level features laminate wood. 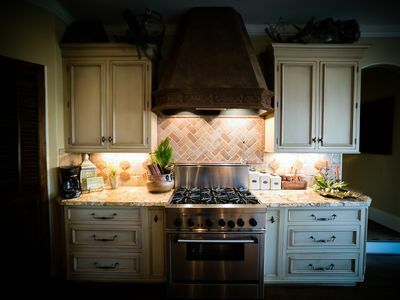 Tuscan style kitchen has gas range, dishwasher, microwave, Kuerig coffee maker, toaster and large central island. The dining room is converted into a large office with desk for your use. High speed fiber optic wifi throughout home and will reach backyard. This house also boasts a finished walk out basement with full bath, 50" plasma, surround sound, refrigerator, closet space and can be used as a 5th bedroom upon request (essentially a 2nd Master BR) which walks out into spacious half grass, half wooded lot with hot tub (not always operational) outdoor grill, and patio. Freshly painted furnished screened in porch with ceiling fan and flat screen directly off open concept main living area/kitchen which gives fantastic views of nature. 4 bedrooms upstairs. Each bedroom has ceiling fans and come with clothing racks. All linens supplied. Upstairs Master has flat screen, King size fully adjustable Sleep number bed. Master bath features dual vanity, spa tub and custom shower with multiple heads. 2 twin beds in 2nd room. 1 Queen bed in 3rd room. The 4th bedroom has a flat screen and PlayStation 3 that utilizes a brand new full size futon (we shopped for the most comfortable one available) . Living room has brand new (purchased in July '17) extra large and comfortable, reclining couches, ceiling fan and 65" mounted smart UHD tv with gas fireplace. Home is cooled by two central air units for full control of upper and lower levels. HE washer and dryer located on bedroom level. No going up and down stairs to wash! There is an additional large front room for relaxing, luggage, storage, play area or whatever your needs. This home is very clean and well kept and ready for you to enjoy! We do run a small local business and may need to access to garage from time to time but will coordinate for convenience. This is a lovely home with the following: 1. Our Beds - > New Memory Foam mattresses - comfort and pressure relieving support for a better night's sleep > Mattresses are fully encased in a smooth, lightweight, waterproof Breathable Mattress Protector to form a reliable barrier against bed bugs, dust mites and allergens. > Pillows are encased in Premium 400 Thread Count 100% Cotton Zippered Pillow Covers Pillow Protectors that are Hypoallergenic Dust Mite & Bed Bug Resistant Anti-Microbial . > Quilts are light weight cotton. > Sheets are SOLID WHITE and CLEAN and NEW. All Beds and Bedding were bought new in March 2017. Kitchen > New Appliances - Refrigerator/Freezer - Stove - Microwave Included in Your Stay: All bed linens and towels - soap – shampoo/conditioner. Coffee – Tea – Honey – Sugar – Cream - Ice – Dishes – Silverware – Utensils - Pans – Toaster – Blender – Dish Towels – Dish Soap – Cleaning Supplies – Blow Dryer – Ironing Board – Iron – Wifi – 1 TV’s, 200+ cable channels, Hulu, etc. Small Pets are OK with owners pre-approval. The yard is not fenced in. This house is perfect for traveling nurses, health care professionals, business professionals. Monthly rate is $2200 Minimum 30 day stay. 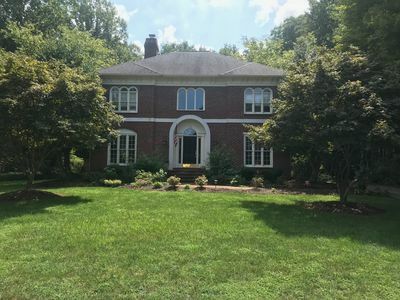 Classic brick executive home in a great location. Over 4000 sq ft, perfect for entertaining, a group getaway, or a family vacation. Fully equipped chefs kitchen with breakfast area plus a formal dining room. Nicely appointed office with printer, fax and scanner for any working travelers. 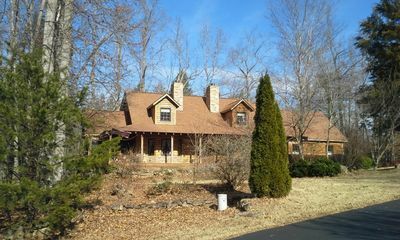 Located in a prime location, close to shopping, restaurants and easy access to I-40 and the loop. All linens provided and ready for your stay. Fenced back yard with swimming pool provides great entertaining as well as a great space for your pet. Pet friendly with an additional fee. 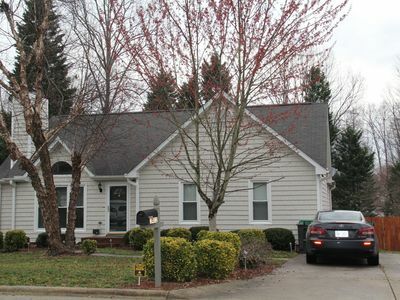 Beautiful family home in a quiet cul-de-sac right in the middle of Greensboro. Beautiful kitchen, spacious bedrooms, and a beautiful brick patio. Perfect for business travel, family vacation, or a single get away with lots of space. 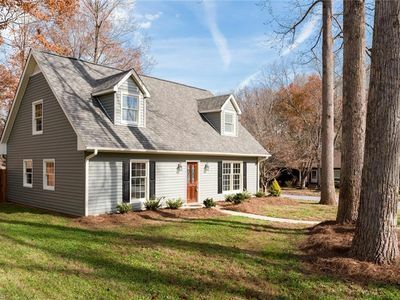 Close to everything in Greensboro! Enjoy all of the amazing restaurants, family activities, or just relax in our beautiful home. There are 2 king beds, 3 queen beds, 2 cribs and a sofa sleeper in addition to a beautiful formal dining room, kitchen with kitchen eating area, parlor room, den and a beautiful brick patio. 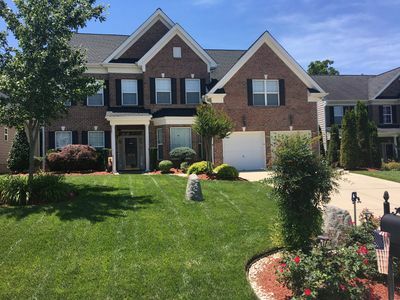 The house has 5 bedrooms, 3.5 baths and plenty of room to enjoy your stay in the Greensboro area. Wake up to the birds singing and the coffee brewing. 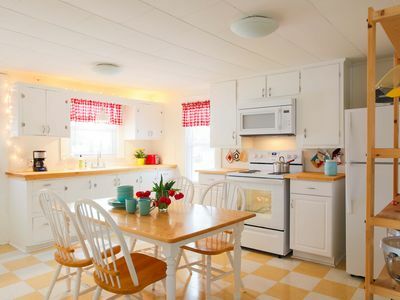 We are one of the few vacation rentals that serve you a scrumptous breakfast each morning in our area. Our home is close to High Point, Winston Salem, Greensboro and all the great features there abouts. Pro Minor League baseball, Nascar racing, NCAA sports tournaments, historical villages, local vineyards, Winston Cup museum, High Point furniture market, etc. Relaxing Cottage close to everything! Perfect for 2!Wi-Fi, Keurig,Outside space! It is an ideal and affordable place for all types of visitors especially families with kids. 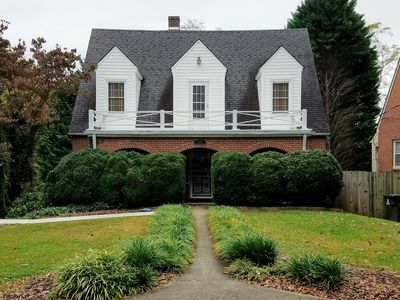 This 3 bedroom house is located between Wake Forest University and WS Downtown. Minutes away from BB&T Field and LJVM Coliseum. Walking distance to bus stops. 6-10$ UBER ride distance from downtown restaurants and pubs. Fully furnished 3 bedrooms with closet. 1st bedroom close to dining room has full size bed. 2nd bedroom has queen size bed. 3rd bedroom includes twin size bed and kid bed which is convenient for infants and toddlers. This room offers toys for kids. Full use of access to kitchen items; Microwave, toaster, coffee maker (includes coffee, cups, creamer and sugar), all utensils needed for cooking. We also have small grill on the porch area. My place is close to the airport, major highways, shopping and dining and all that Greensboro and High Point have to offer! . 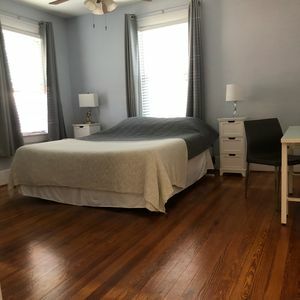 You’ll love my place because of the great neighborhood and convenience to whatever brings you to the area. . it is good for couples, solo adventurers, business travelers, and families (with kids). This has all the amenities of home. A well equipped kitchen has a dishwasher, microwave and washer and dryer, and of course a full sized range and refrigerator. There is also an outdoor balcony as well as a dining table for you to enjoy your meals at. The bedroom closet and chest of drawers is very functional. Guests have use of the whole unit, the entrance is from locked common area, with plentiful parking. Check in time can be very flexible depending only on the time needed for cleaning between guests. We are convenient to shopping, eateries, much more. The location is fabulous and Uber is wonderful to get you anywhere. I live and work nearby so I am available. Very close to down town and freeway access to everywhere,it boasts a vibrant new arts district and cute bars and breweries nearby. It is a mixed neighborhood in every respect and I have lived in this neighborhood for 8 years and love it here. Fully furnished 1-bedroom, 1-bathroom rustic modern loft apartment features an open floor-plan. Large windows overlooking Bailey Park at Innovation Quarter. Private entrance, with lockbox for easy check-in. Lots of local attractions, walking distance via along Long Branch Trail to Old Salem and its shops, restaurants, bars, Cobblestone Farmers' Market, Washington Park and the lovely, shady Strollway leading to downtown. 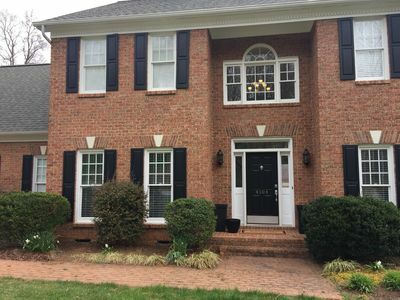 Close to Old Salem, UNCSA, WS Arts District, BB&T Ballpark, Wake Forest, Reynolda House, Wake Forest Baptist Medical Center, Pilot Mountain, Wineries & much more. Queen sized bed, large bathroom with walk-in shower, and kitchen with island. Comfortable sitting area with smart TV, lots of storage and free WiFi. Aveda Salon located below. Perfect for the professional business entrepreneur and small family. Fully furnished townhome conveniently located between Wendover Avenue and Market Street. It is a well kept 2 floor townhome close to everything. Easy access to I-40 and I-85. Close to countless restaurants, shopping malls, and hotels. The townhome is located in a very quiet area. It features 2 rooms. Master bedroom has a king size bed and the guest room has a bunk bed with a full bed on the bottom and a twin on the top for children. Please no smoking inside the house and no pets. 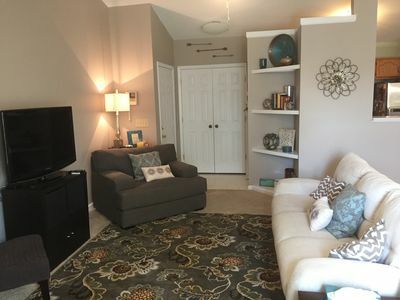 This is a brilliant, location friendly, condominium in a quiet neighborhood that rivals many hotels in terms of cleanliness and comfort, In walking distance to Starbucks, Harris Teeter, and many restaurants. This is an upstairs unit with a deck. The condo can comfortably sleep six as it is equipped with two twin electric blow up beds with proper linen and pillows for both. 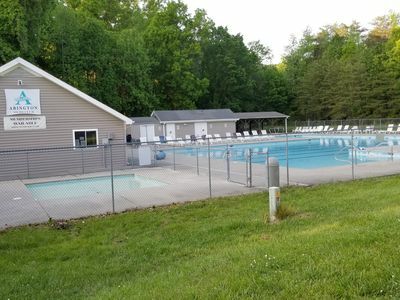 Located in a well established condominium community less than a mile and a half from WFU (Wake Forest University) and near major arteries like Silas Creek and Reynolda Rd. Cute one-level 3 bedroom, 2 bath house with a large backyard. Spacious deck with a built in hot tub. Layout: Upon entering the front door, the living is on your left, one bedroom is on your right. Past the living room is the dining room to the left, and a newly updated and spacious kitchen to the right. Walk through the dining room to get to the large deck with benches along the railing and a built in hot tub. Before the kitchen to the right is the hall leading to another bedroom. In the back right of the house is the second bath and the master bedroom with an attached bathroom. The washer and dryer are between the 2nd bedroom and the 2nd bath. Master bathroom has a separate toilet, a garden tub, a shower, a double sink, and a skylight. Master bedroom also has access to the back deck. TVs are located in the living room and each bedroom. Wifi is available throughout the house. Master Bedroom has a queen bed, large dresser, deck access, walk in closet, and spacious attached bath. Second Bedroom has a queen bed, large dresser, TV, and large closet. Third Bedroom has a queen bed, small desser, TV, and large closet. Elegant Pet Friendly Ranch Home close to everything! 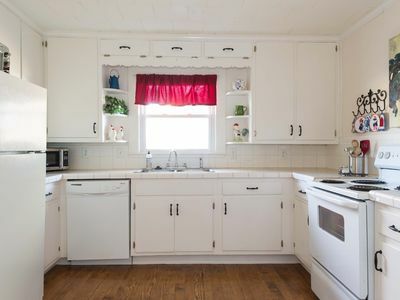 Our sun filled updated 1950 s single family ranch home in a quiet and beautiful neighborhood has all the comforts needed for a long or short stay. 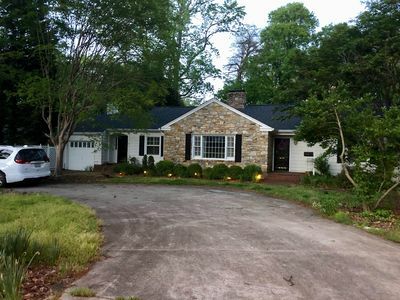 Fabulous location-just minutes to multiple universities, hospitals, historic sites and downtown Winston-Salem. Nearby are plenty of restaurants, shopping and recreational parks. Piedmont Triad Airport in Greensboro and High Point Furniture Market are each 35 min away. 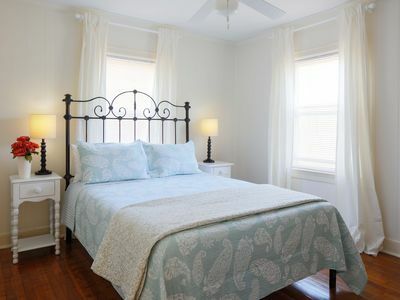 This newly renovated flat is a charming getaway for your next stay in Winston-Salem, NC. Located in downtown Winston-Salem just steps away from Old Salem Museums and Gardens, our guests enjoy the serenity of the town as well as the convenience to the many activities that this arts and cuisine community offers. Preserving the original structure of the building, the flat’s interior is decorated to enhance the grand ceilings, original hardwood floors, beautiful large windows and a modern kitchen. This distinguished 2 bed/2 bath apartment offers complete comfort with stylish furnishings but even more importantly its location is perfect for visitors wanting a central location to explore the area. A 2-minute walk will take you 250 years into the past as you arrive in Old Salem Museums and Gardens. A few steps across the parking lot and you can enjoy NC Chef of the year cuisine or visit Kaleideum Children’s Museum. One block away you can enjoy a hot cup of coffee and a tasty treat at The Hive or Camino Bakery. Take the stroll way into the heart of downtown Winston-Salem for some shopping on Trade and 4th street. 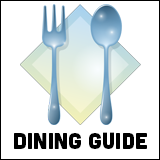 Save room for something to eat as Winston-Salem offers a large selection of culinary magic provided by our local chefs. Within driving distance, you can visit local wineries, art museums, Salem College, UNCSA, BB&T Ballpark, Wake Forest, Baptist Hospital, Reynolda House and Pilot Mountain. Triad III-Spacious 2BR Condo! Newly remodeled!! Great Location!!!!!! 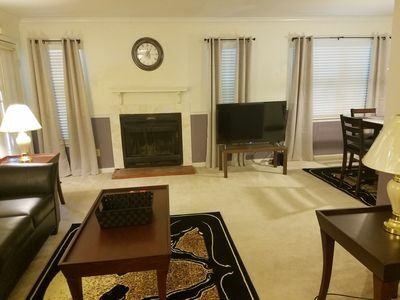 You will feel right at home in this beautiful 2 bedroom/1 bath condo in Greensboro, NC conveniently located to all area hospitals, downtown, the Greensboro Coliseum, shopping, restaurants, Winston Salem, I-40/Wendover Ave and more!! This condo is fully equipped with everything needed to help you enjoy your stay! Very safe and secure! This condo has been recently upgraded and is fresh with nearly everything in it new. 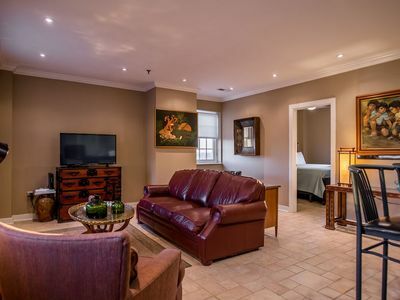 This condo is set up to accommodate short term travelers, vacationers, business people and traveling nurses. Newly remodeled unit in a very popular community close and convenient to everything! This condo is in the same community as our other properties "TRIAD I and II". All condos are identical with the exception of wall color/flooring. This condo is fully equipped with everything you need to help you enjoy your stay! WiFi and a brand new 49" SMART HDTV ROKU TV included!! ALL furniture is new including bedroom sets with Simmons Beauty Sleep Mattresses! All new leather couch/tables! All new dining set! Upgraded kitchen appliance package! EVERYTHING in the kitchen, from cookware to serving ware, is new!! 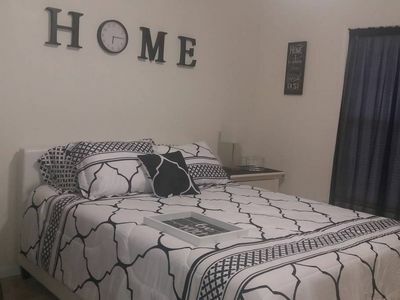 Washer/dryer are included and located in the unit---Our goal is to be sure you are at "home away from home" and all of your expectations are met------DATES NEEDED NOT AVAILABLE? Check the TRIAD I or II for availability--- Guests have private access and use of this entire condo...Entry way, 2 bedrooms, 1 full bath with shower and tub, fully equipped kitchen with all the essentials space and living room equipped with a SMART ROKU flat screen (cable available). Wifi is included. Private patio with privacy. This unit also has an attached storage unit for your use as well. Please send any questions you may have and receive a prompt response. We are within 20 minutes of this location to assist and accommodate with anything you need! Private bedroom in a great downtown location. Queen sized medium firmness memory foam mattress with memory foam pillows, 32in LCD flat screen TV with Apple TV for streaming Netflix and Hulu. The property is fully fenced in and has a private courtyard...great for having a cocktail or for working on your laptap. 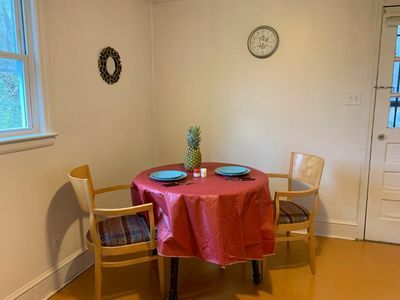 The room is located in a very quiet and safe neighborhood situated in the Historical West End area of Winston Salem. Great for the business traveler and walking distance to downtown! Please note: Bathroom is shared with other guests that may or may not be renting a room. PRIVATE ENTRY SUITE - Comfy Sterns & Foster KING bed, Deck, Separate Den with Workspace and sofa bed, Two TVs, Netflix, and Robust WIFI. Walking distance to Restaurants, Fresh Market, Science Center and Country Park (walking/hiking, mountain bike trails, cycling/walking greenway) - 10-15 minutes from the Friendly Center, Greensboro Coliseum, Piedmont Triad Airport, UNCG, NCA&T, and Guilford College - A Private, Comfortable, and Convenient Space in a Safe Neighborhood. We travel extensively and love VRBO. We have worked hard to make this room everything a traveler could ask for. You will be greeted with a basket of goodies and coffee to make it through breakfast. The bed is a king size and super comfy. A sofa-bed is also available in the den area. The two-room suite with private tub/shower is locked off and insulated from the rest of our home for your assured privacy. You are free to come and go as you please with off street parking. Both rooms have flat screen TV’s with an Apple TV hooked up complete with Netflix. Both rooms have new hardwood floors and empty cedar lined closets with plenty of space. The den area is equipped with coffee maker, desk, mini fridge and microwave. The small deck table can easily be pulled inside if needed for extra dining space. However, the new deck offers a great place to sit and have your morning coffee as you watch the neighborhood wake up. Our neighborhood is safe and well established with mature oak trees. Walking/Cycling is a pleasure, as Greensboro Country Park and Guilford County Courthouse are all accessible by just a short stroll. The Bicentennial Greenway is also easily accessible for the cycling enthusiast. Top unit of a three-family house, this newly renovated two bedroom, one bath apartment is in the heart of downtown Winston-Salem. 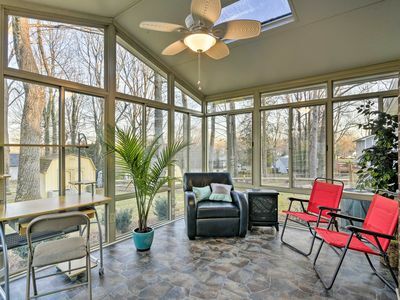 It is an ideal location two blocks away from all of the action of Fourth and Trade Streets, tucked into a funky, tree-lined neighborhood that is pleasantly quiet and private. Walkable to all that downtown has to offer, including the BB&T Ball Park, the Hanes Theater, Hanes Park, millennium Center, Benton Convention Center, Washington Park, the Stevens Center, the Children's Museum, Bailey Park, the Innovation Quarter, Old Salem, Aperture Theater, Sawtooth, YMCA, Washington Perk Market and all of the restaurants, cafes, bars, breweries, coffee shops and art studios that downtown has to offer. Bike trails, walking trails, the Strollway and dog parks surround the apartment. 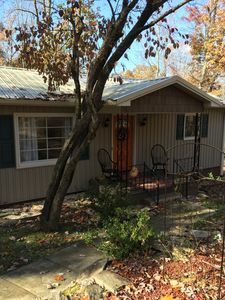 The apartment is centrally located, immediately on a bus stop and blocks away from Business I-40 and Rt. 421. Wake Forest University and Hospital, Forsyth Hospital, Winston Salem State University, Southeastern Center for Contemporary Arts, NC School of the Arts, Whole Foods, Publix, Harris Teeter, Food Lion, Hanes Mall, Old Salem Lake, Rock Quarry Park, are within a ten minute drive or less. Pilot Mountain and Hanging Rock are excellent for hiking and within a thirty minute drive. Fifteen minutes from here is the oldest medicinal herbal garden in the United States. It's located in Bethabara, which, along with Old Bethania are great spots of history. Greensboro, NC is about 30 minutes away and High Point, NC is 20 minutes away (that's where the Furniture Market is). Piedmont Triad International Airport (PTI/GSO) is 17-20 minutes away. The space itself is clean, bright and airy. The kitchen may be the crown jewel of the apartment, with half of it encased in glass, allowing for lots of light and pretty views as you enjoy your morning coffee or evening wine. It has white quartz countertops, stainless steel appliances (including a dishwasher and garbage disposal) and a reclaimed granite backsplash. We've got it stocked with coffee, tea, a bit of breakfast and your kitchen essentials. Hardwood floors are throughout the apartment, minus the bathroom, which is tiled. The bathroom was remodeled last year and the tub, shower, vanity and all hardware are squeaky clean. There are bathroom basics stocked: hair dryer, soap, shampoo, conditioner, lotion, disposable razors, toothpaste etc. There are two bedrooms, each with a king sized bed, small drawers, a desk and a place to sit. Both bedrooms have closets with luggage racks and hangers. One of the bedrooms has a small laundry closet with a stackable washer/dryer unit. The living room has a comfy couch that could sleep one. In addition, we have a small TV. We do not have cable, but we have very fast Internet. In the closet, there is a futon that can be pulled out to sleep one: a small adult or child. The apartment has two decks - a somewhat spacious one great for lounging and eating outside when the weather is nice, and a small back one for gazing at the pines or watching the fireflies. The apartment features filtered water throughout - we have a whole house water filtration system. As mentioned above, there is free, fast Internet. There is no smoking in the apartment, but we do have a compost bin and recycle if you like those things. The property is surrounded by plants and trees - and depending on time of year, vegetables, figs, blueberries, passion vines and kiwis - lending a feel of privacy or that you are living in a tree house, despite having downtown W-S in the view from your window, a minute or two walk away. Winston-Salem is enjoying the surge of the local food movement, with many independent restaurants supporting local farmers and the farmer's market. Krankie's Wherehouse, Muddy Creek, Mary's Gourmet Diner, Black Mountain Chocolate and Twin City Hive are some locavore gems to explore. We invite all travelers, explorers, students, teachers, wanderers, artists, folks going to conferences or interviews and everyone else to stay with us. 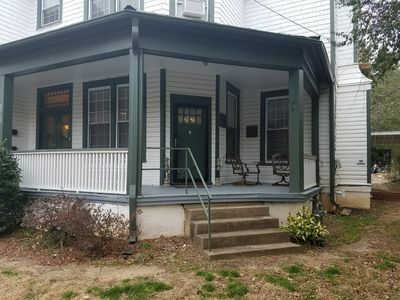 You will enjoy the new renovations to this 1 bedroom, 1 bath apartment in a Historical 1870's converted house in downtown Winston-Salem. The apartment is decorated in a Victorian style and has wonderful warm feel as you make yourself at home. It has 12 foot ceilings and a large living area with a Massoud couch, accent seating, and a new television with wi-fi for streaming. The kitchen has a new counter top and microwave and other new appliances, cookware, and dishes as well. A full size refrigerator and stove make this kitchen top notch for making your own meals. A high top bistro set is outside the kitchen to enjoy your meals. The bedroom has a full-size bed and beautiful vintage and antique furnishings. There is an antique wardrobe for storing your clothes. The french style bedroom doors bring style and distinction to this lovely apartment. Also, for your enjoyment, outdoor seating is provided on the front porch. On street and off-street parking is available to guests. 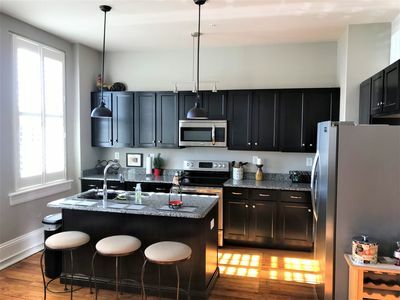 It is in walking distance to local favorite places such as HanesBrand Theater, BB&T Ballpark, the Sawtooth Center, and the many restaurants and bars on 4th Street. BB&T headquarters is 1/2 mile away. For guests who prefer a professionally brewed cup of coffee, the West End Coffee House is around the corner. It is also within one mile of the on and off ramp to Business 40. This location is perfect for vacation travel, business travel, visiting friends and family, and romantic getaways. Private Townhouse in North High Point, NC. Perfect location for all occasions, within 5 miles of downtown High Point Furniture Market and High Point University. In walking distance to shops, restaurants, grocery stores, movie theater, gas stations, drug store, medical centers, banks, fitness centers, and nightlife. 10 miles from Greensboro PTI Airport, 20 minutes from Winston-Salem and 15 minutes to downtown greensboro. The Triad II---Spacious 2BR Condo---Newly remodeled!! Great Location! !